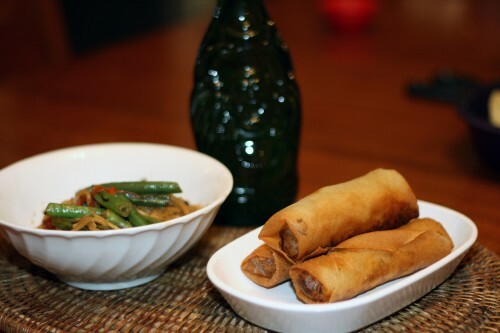 Week 2 cooking challenge was Chinese food and I madeÂ chicken spring rollsÂ to go along with a chicken stir-fry. If you don’t have a lot of time to make dinner, stir fries are the perfect solution because they cook up so fast. I used pancit canton noodles that I found at Asian Market, and they cooked up in about four minutes. 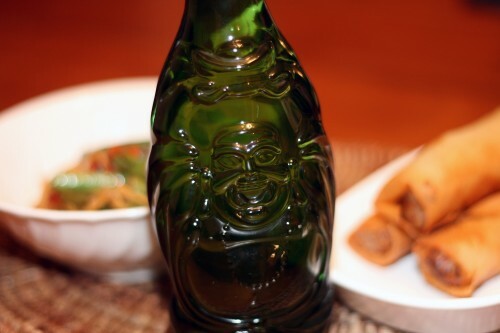 We enjoyed our stir fry and spring rolls with a Lucky Buddha Beer. For a beer bottle, I think this guy takes top prize for being the cutest beer bottle I’ve seen. It was a light crisp beer, very drinkable. Today many people across Asia (or with Asian roots) are celebrating Year of the Dragon. If you didn’t know today is the Chinese (lunar) New Year. One thing I love about other cuisines is the tradition and/or superstitions attached to certain foods. For example, don’t break up your noodles when you cook this dish because long noodles symbolize longevity, a long life. I can’t think of any symbolism attached to foods typically eaten on the standard American diet (correct me if I’m wrong). Rinse black beans. Drain and roughly chop. Heat wok until very hot, add 2 T oil, swirl around to coat sides. Stir-Fry the chicken in batches, until brown. Remove from wok and set aside. 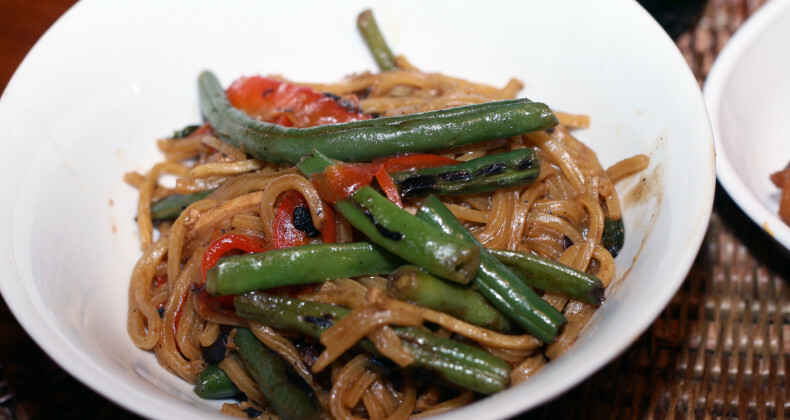 Reheat wok until very hot, add 1 T oil and stir fry peppers and green beans for 1 minute. Add garlic, onions, black beans, and sugar cook for 1 min. Sprinkle with 2 T water, cover and steam for 2 minutes. Gently separate the noodles and add to the wok with the chicken, oyster sauce, soy sauce, and chicken stock toss to combine everything. Cook, covered for about 3-4 minutes until the noodles soften. Stir.